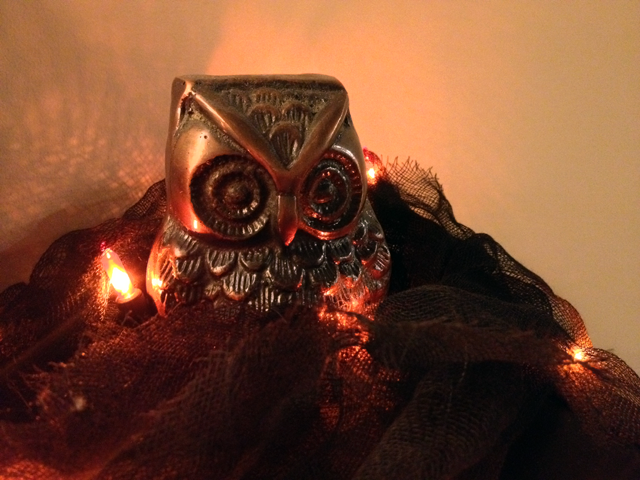 I don’t usually go wild decorating our home for holidays, but the rules don’t apply at Halloween. If it were up to me, I’d morph our apartment into Jack Skellington’s Halloween Town in a heart beat. I have a hard enough time not breaking out the decor mid-September as it is. But it’s October now… so game on! The circle garland is last year’s creation and I love it more than ever. The patterns are quirky, and they’re perfectly complemented by the paper’s saturated hues. I think bold pops of lime and teal make even Halloween decor look chic. I draped the garland from our loft’s balcony and it’s super schnazzy! Unfortunately, the pictures are just too crummy to share. Disappointing, but I’ll keep trying! Every year, my mom sends me a package filled with Halloween goodies and it’s the best. This year’s stash included adhesive bats and a gauzy black garland. 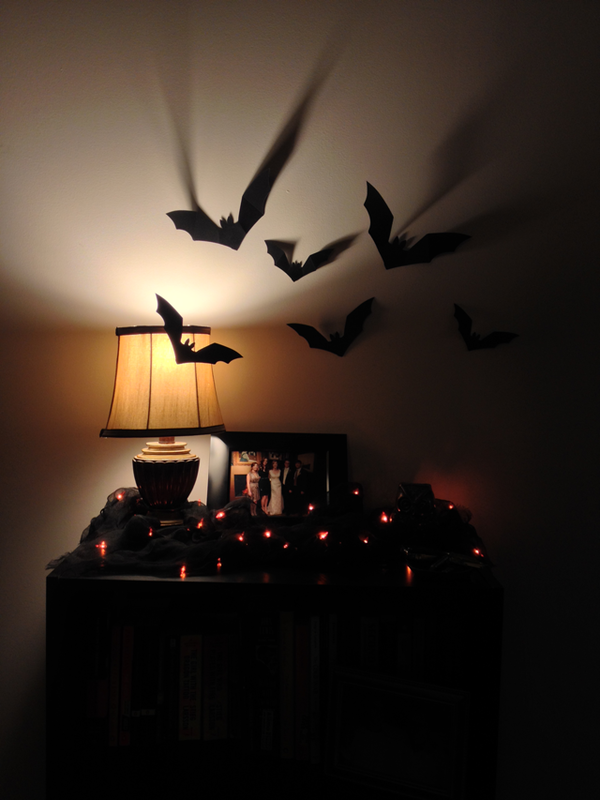 With new supplies in hand, I transformed our entryway bookshelf into bat central. The owl is an old friend, but I thought the bats could use some company. My decor to-dos include a wreath and funky pumpkins. Have you started decorating yet? What are your plans? See, craft time can be badass, too. I have an obsession with paper garlands. Every occasion, every season has its own. Halloween – Garland. New apartment – Garland. Finally stopped raining – Garland. They’re an inexpensive way to personalize your home or decorate for a celebration, and you can whip one up in an hour or less. Basically, garlands are wonderful little creatures and you should make some. Or many. 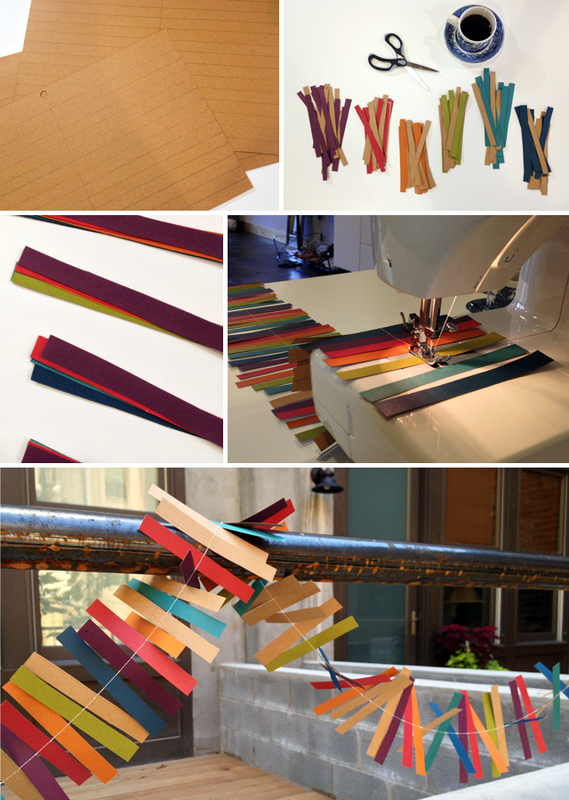 The Bugle Garland is made by sewing together long, skinny strips of card stock. Super easy. I wanted saturated summer colors, so I went with a bold but slightly-off rainbow scheme. Simply measure, cut, stack, and sew. The strips were 1/2″ by 6″ and I repeated the color progression twenty-four times. Don’t worry about cutting perfect rectangles, or lining the strips up exactly down the middle. Imperfections add visual interest! 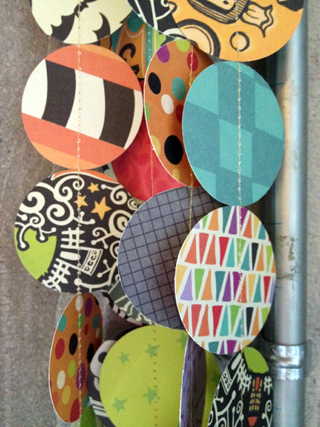 In case you were wondering, I used Tim Holtz Kraft-Core Nostalgic Collection card stock. It’s my go-to for solid colors. 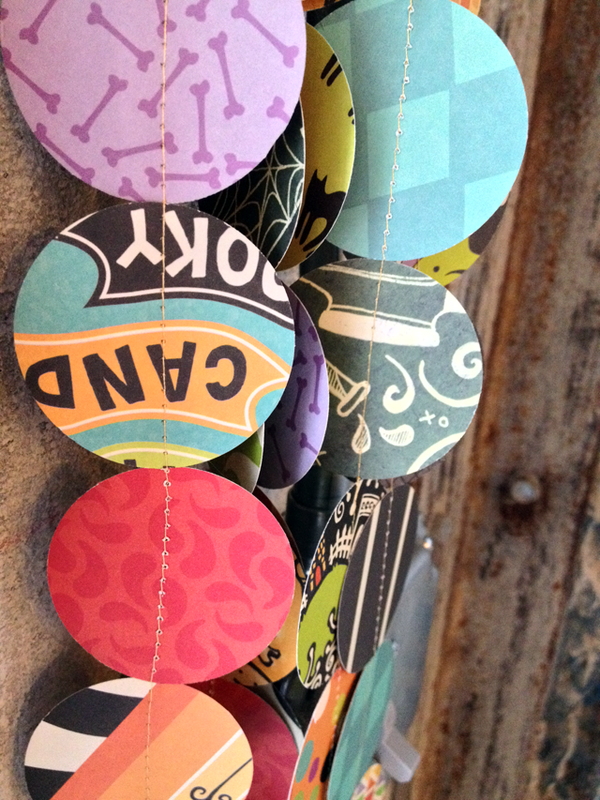 The craft paper tones down the brightness of the garland while also drawing attention to the way it spins. I’d love to see your take on the Bugle Garland! Email pictures of your version(s) to folklorecraft@gmail.com, and I’ll happily post them for all to see. 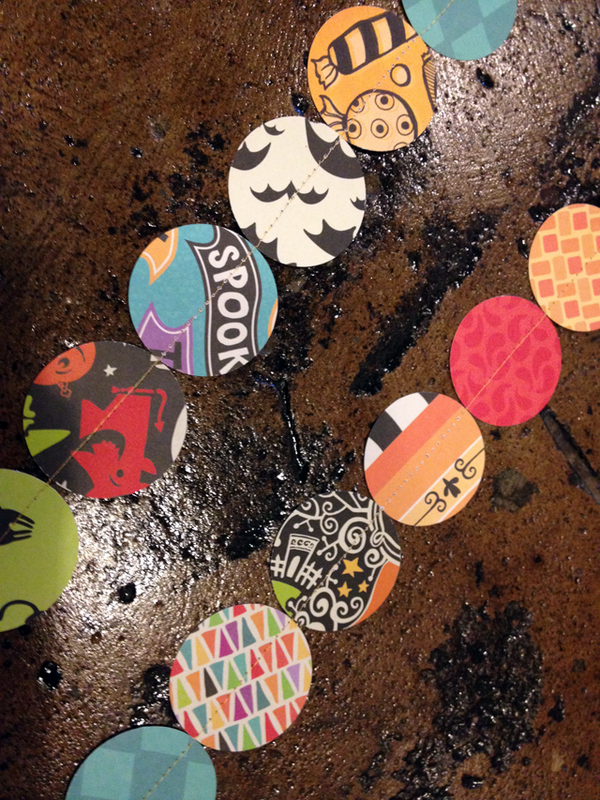 Creativity makes the world go ’round – metaphorically of course. Thanks for visiting. Want to connect? Feeling inspired? You are invited to share your creativity with folklorecraft@gmail.com.